Unbelievably, that horrible-looking Peter Rabbit movie shredded the box office like a head of lettuce earlier this year. The live-action/CGI film earned a whopping $326M worldwide and put the thieving bunny on a number of ad campaigns domestically. That's how we reward the crime of vegetable thievery in this country, with commercials! Well now Sony wants to bring Peter back for more mischief. 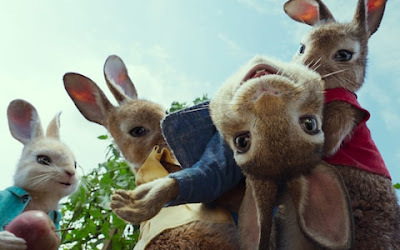 Variety reports Peter Rabbit 2 is in the works with original director Will Gluck returning. What we don't know is if James Corden will be back to voice Peter, or if Domhnall Gleeson will reprise his role as the traumatized farmer who was happy with his garden on his little patch of land before that rabbit came along. Others in the cast included Rose Byrne, Sam Neill, Daisy Ridley, Elizabeth Debicki, and Margot Robbie. Something tells me it might be tough wrangling all of them in again. Sony's moving fast on this, too, setting the sequel for February 7th 2020.